Neil Riordan, PhD is the Founder of the Stem Cell Institute in Panama. He is also the Co-Founder of Medistem Inc in San Diego and the current President of Medistem Panama. Dr. Riordan is speaking at a Stem Cell Institute patient outreach event held in Miami in May 2013. In part 1, Dr. Riordan discusses the background of Medistem Panama and the Stem Cell Institute (SCI) in Panama. He presents the types of stem cells used at SCI: Patient’s own bone marrow, Patient’s own fat tissue and umbilical cord mesenchymal stem cells donated from live, healthy births. Dr. Riordans goes on to discuss: collaborations with UC San Diego, Indiana University, University of Utah and University of Western Ontario; patents and publications; Medistem Panama lab, clean rooms and equipment; Why the Stem Cell Institute is in Panama; Panamanian stem cell laws; What are mesenchymal stem cells (MSCs) ?, mesenchymal stem cell homing, how MSCs induce repair, how MSCs modulate the immune system, young vs. old MSCs, Are MSCs safe? ; MSCs are actually pericytes. They are found throughout the body in all vascular tissues around blood vessels, bone marrow, umbilical cord, placental tissue, menstrual blood and teeth; Stem Cell Institute’s source of umbilical cord MSCs: live, healthy birth, mother screened for medical history, consent from family for donation, mother tested for infectious diseases, cord tested for infectious diseases and sterility; the mesengenic process; how pericytes respond to injury and form “medicinal MSCs”; MSCs are anti-apoptotic, anti-scaring, angiogenic, and mitotic. 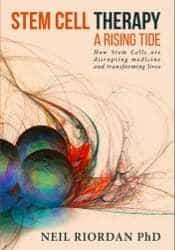 ; MSCs are also immunomodulatory; MSC homing in rats; Human MSCs decline drastically with age; Stem Cell Institute uses umbilical cord-derived MSCs because they are non-tumorigenic, very robust – high number of doublings, faster doubling time,; What does ‘doubling’ mean? 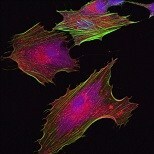 ; Effects of aging on MSCs. 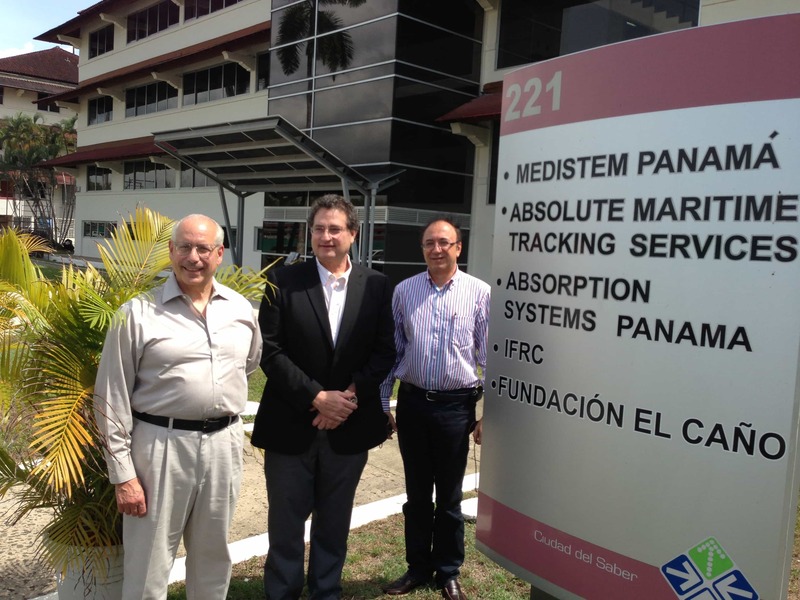 Professor Arnold Caplan (left) and Professor Riccardo Calafiore (right) pose with Medistem Labs Panama Founder, Neil Riordan, PhD. Dr. Riordan is also the Founder of Stem Cell Institute in Panama City, Panama. 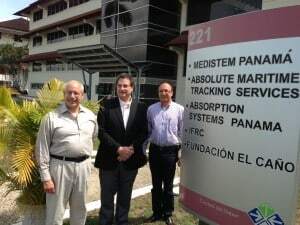 Prof. Caplan and Prof. Calafiore were in Panama City with Amit Patel MD to speak at “La Medicina Del Futuro En El Presente”, an event organized by the honarable Ruben Berrocal MD, Minister of Science, Technology and Innovation SENACYT (National Secretariat of Science, Technology and Innovation) and Prof. K. S. Jagannatha Rao, Ph.D., FNASc, FABAP, FASB, FLS (Reino Unido) Director INDICASAT-AIP (Instituto de Investigaciones Cientificas y Servicios de Alta Tecnologia – Institute for Scientific Research and High Technology Services). Prof. Caplan is a Professor of Biology and General Medical Sciences (oncology) at Case Western Reserve University and the Director of the Skeletal Research Center at Case Western Reserve. Prof. Caplan is widely regarded as “The father of the mesenchymal stem cell”. Prof. Calafiore is the Head of the Division of Endocrinology and Metabolism at the Medical School at the University of Perugia, Italy and Director of the Interdisciplinary Laboratory for Endocrine and Organ Transplant at the University of Perugia School of Medicine. He is also a director at ALTuCELL. 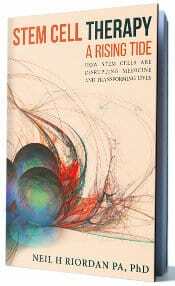 Neil Riordan PhD is Founder of Stem Cell Institute in Panama City, Panama and the President of Medistem Panama. He is also CEO of Aidan Products. “First I must say I have been steadily getting better. Everyone notices it. My long distance friends have all commented on the vitality and clarity in my voice. So much is changing in my body for the better. I can’t thank the staff at the SCI enough for saving my life. And of course, my beloved Dr Cheney, who knew better than anyone how sick I was … I feel such gratitude. I was slipping into dementia from severe and unremitting CFS. I was desperate for help and when Dr Cheney invited me to go there in May, in my heart I knew I was going to get my life back. I was so sick that almost any quality of life was gone for me and I either wanted to die or get better. I was at the end of my rope as I was in constant and unrelenting pain, slipping away with dementia and fully bed-bound and home bound for several years after being vibrantly alive, loving life as an artist and a professor at the University of Minnesota, mother, wife and lover of life. Anyone who speaks to me on the phone comments on how well I sound. Lately, I have heard in my voice an “authority” and sense of articulation that I once had when I was a professor and artist. My brain is healing and I have energy everyday. I still must rest most days but I want to get up and begin to rebuild my life. Incipit Vita Nova- Here begins the new life! I feel inspired! Before stem cells, I spoke often in a whisper as my vocal cord were weak and I would quickly tire, slur my speech and need to stop talking as it would exhaust me. I easily crashed from less than 10 minutes of phone conversation. Comments from friends regarding getting well- ”woo yaa! Susan, you are lucid!” “You are back!…”look at you, your cognitive function is so much better.” I hear these comments everyday. I was able to titrate from 40 mg to 5 mg of Cortef shortly after my 2nd visit to Panama. Now I plan to titrate off Cortef completely. With that, the bloating and weight gain is finally coming off my body. I’ve regained peristalsis after 13 yrs. No more falling! My balance is good and am able to climb out of, for example, a bath tub – I’m getting stronger! Falling was a constant worry and I did eventually fall and break my back recently. That was the final straw and I developed PTSD. I feel less pain now in the area of the herniated discs and I wonder if the stem cells will repair such injuries . Falling was a constant worry for my husband, there was a sense that my feet were not connected to my brain. Now that worry is in the past. Fat turning into muscle, I can now stand up from a sitting position without the help of my arms pressing me up. My family comments on my form transforming. Overall, more resiliency, vitality and cognitive improvement. I am able to organize. I’ve been able to declutter and organize much of the piles of paperwork and miscellanea that have been piling up for a decade. . CFS made organizing impossible for me. I’ve heard that this is not uncommon. I now have the energy to stay focused for 2 – 4 hrs at a time sitting in a chair doing paperwork or some task ( I have not had the strength to sit in a chair for 5 – 6 yrs. I wake up the each day full of energy, not crashed. Although I do feel muscle and joint pain from moving and so still need pain meds. But the most important thing is I rarely crash. I can be modestly active every day. Memory! Although not perfect (I believe in part due to morphine) I am so much better. I can remember combinations of numbers on the spot. I know what I did the day before, the week before and what is planned in the future. I can remember what I wanted to do from day to day. I am able to feel inspired and that is carried through the day to the next and the next. No amount of occupational therapy with strategies to support my memory ever worked. It’s hard to explain how far gone I was. I was lost to myself and I think it was the most terribly painful part of my experience of CFS. 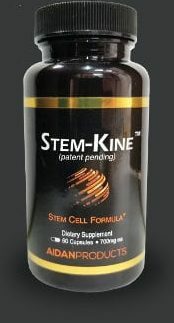 Regaining myself did not begin until after I was home from the 2nd stem cell protocol. And I am certain I needed the 30 day MS Protocol. None of these brain problems improved the first time and I could feel I was on a slow and disappointing slide backwards. Holly Huber shares her uplifting story about receiving stem cell therapy for MS at the Stem Cell Institute in Panama City, Panama. Ms. Huber was speaking at a stem cell seminar in San Diego, CA. Mesenchymal stem cell homing to tissue damage, umbilical cord stem cells historically used for anti-aging, mesenchymal stem cells role in immune system modulation, inflammation reduction and stimulating tissue regeneration, donor stem cell safety and testing, the role of HLA matching in donated umbilical cord-derived stem cells, umbilical cord blood safety data and historical use in blood transfusions, allogeneic stem cell persistence in human mothers. Case studies of spinal cord injury patients treated with CD34+ and mesenchymal stem cells harvested from human umbilical cord Wharton’s jelly and cord blood, animal studies using mesenchymal stem cells, immunosuppression requirements in allogeneic stem cell treatments, intrathecal and intravenous administration of autologous bone marrow stem cells in spinal cord injury patients, and the role adult stem cell trophic factors in tissue regeneration.